According to Hesiod Geryon had one body and three heads, whereas the tradition followed by Aeschylus gave him three bodies. A lost description by Stesichoros said that he has six hands and six feet and is winged, there are some mid-sixth-century Chalcidian vases portraying Geryon as winged. Some accounts state that he had six legs as well while others state that the three bodies were joined to one pair of legs. Apart from these bizarre features, his appearance was that of a warrior. He owned a two-headed hound named Orthrus, which was the brother of Cerberus, and a herd of magnificent red cattle that were guarded by Orthrus, and a herder Eurytion, son of Erytheia. In the fullest account in the Bibliotheke of Pseudo-Apollodorus, Heracles was required to travel to Erytheia, in order to obtain the Cattle of Geryon (Γηρυόνου βόες) as his tenth labour. On the way there, he crossed the Libyan desert and became so frustrated at the heat that he shot an arrow at Helios, the Sun. Helios "in admiration of his courage" gave Heracles the golden chariot he used to sail across the sea from west to east each night. Heracles used it to reach Erytheia, a favorite motif of the vase-painters. Such a magical conveyance undercuts any literal geography for Erytheia, the "red island" of the sunset. When Heracles reached Erytheia, no sooner had he landed than he was confronted by the two-headed dog, Orthrus. With one huge blow from his olive-wood club, Heracles killed the watchdog. Eurytion the herdsman came to assist Orthrus, but Heracles dealt with him the same way. On hearing the commotion, Geryon sprang into action, carrying three shields, three spears, and wearing three helmets. He pursued Heracles at the River Anthemus but fell victim to an arrow that had been dipped in the venomous blood of the Lernaean Hydra, shot so forcefully by Heracles that it pierced Geryon's forehead, "and Geryon bent his neck over to one side, like a poppy that spoils its delicate shapes, shedding its petals all at once". Heracles then had to herd the cattle back to Eurystheus. In Roman versions of the narrative, on the Aventine Hill in Italy,Cacus stole some of the cattle as Heracles slept, making the cattle walk backwards so that they left no trail, a repetition of the trick of the young Hermes. According to some versions, Heracles drove his remaining cattle past a cave, where Cacus had hidden the stolen animals, and they began calling out to each other. In others, Caca, Cacus' sister, told Heracles where he was. Heracles then killed Cacus, and according to the Romans, founded an altar where the Forum Boarium, the cattle market, was later held. To annoy Heracles, Hera sent a gadfly to bite the cattle, irritate them and scatter them. The hero was within a year able to retrieve them. Hera then sent a flood which raised the level of a river so much, Heracles could not cross with the cattle. He piled stones into the river to make the water shallower. When he finally reached the court of Eurystheus, the cattle were sacrificed to Hera. In the Aeneid, Vergil may have based the triple-souled figure of Erulus, king of Praeneste, on Geryon and Hercules' conquest of Geryon is mentioned in Book VIII. The Herculean Sarcophagus of Genzano features a three headed representation of Geryon. The poet Stesichorus wrote a song of Geryon (Γηρυονηΐς—Geryoneïs) in the sixth century BC, which was apparently the source of this section in Bibliotheke; it contains the first reference to Tartessus. From the fragmentary papyri found at Oxyrhyncus it is possible (although there is no evidence) that Stesichorus inserted a character, Menoites, who reported the theft of the cattle to Geryon. Geryon then had an interview with his mother Callirrhoe, who begged him not to confront Heracles. They appear to have expressed some doubt as to whether Geryon would prove to be immortal. The gods met in council, where Athena warned Poseidon that she would protect Heracles against Poseidon's grandson Geryon. Denys Pageobserves that the increase in representation of the Geryon episode in vase-paintings increased from the mid-sixth century and suggests that Stesichorus' Geryoneïs provided the impetus. The fragments are sufficient to show that the poem was composed in twenty-six line triads, of strophe, antistrophe andepode, repeated in columns along the original scroll, facts that aided Page in placing many of the fragments, sometimes of no more than a word, in what he believed to be their proper positions. In his work Description of Greece, Pausanias mentions that Geryon had a daughter, Erytheia, who had a son with Hermes, Norax, the founder of the city of Nora in Sardinia. The Geryon of Dante's 14th century epic poem Inferno bears no resemblance to any previous writings. Here, Geryon has become the Monster of Fraud, a beast with enormous dragon-like wings with the paws of a lion, the body of a wyvern, and a scorpion's poisonous sting at the tip of his tail, but with the face of an "honest man". He dwells somewhere in the shadowed depths below the cliff between the seventh and eighth circles of Hell (the circles of violence and simple fraud, respectively); Geryon rises from the pit at Virgil's call and to Dante's horror Virgil requests a ride on the creature's back. They then board him, and Geryon slowly glides in descending circles around the waterfall of the river Phlegethon down to the great depths to the Circle of Fraud. The Cádiz Memorial is a London monument displaying a captured Napoleonic mortar mounted on a dragon inspired by Geryon. Jump up^ Scholiast on Hesiod's Theogony, referring to Stesichoros' Geryoneis (noted at TheoiProject). Jump up^ Pseudo-Apollodorus. Bibliotheke, 2.5.10. Jump up^ P.T. Eden, A Commentary on Virgil: Aeneid VII (Brill, 1975), p. 155 online. Jump up^ Denys Page 1973:138-154 gives the fragmentary Greek and pieces together a translation by overlaying the fragments with the account in Bibliotheke. Additional details concerning Geryon follow Page's account. M.M. Davies, “Stesichoros' Geryoneis and its folk-tale origins”. Classical quarterly NS 38, 1988, 277–290. Anne Carson, Autobiography of Red. New York: Vintage Books, 1998. A modern retelling of Stesichoros' fragments. P. Curtis: Steschoros's Geryoneis, Brill, 2011. GERYON was a three-bodied, four-winged giant who lived on the island of Erytheia in the westernmost reach of the earth-encircling riverOkeanos (Oceanus). He possessed a fabulous herd of cattle whose coats were stained red by the light of the sunset. Herakles was sent to fetch these as one of his twelve labours. The hero reached the island by sailing across the Okeanos in a golden cup-boat borrowed from the sun-god Helios. There he encountered and slew the cattle-herder Eurytion, the two-headed guard dog Orthros (Orthus), and finally three-bodied Geryon himself. With this task complete the hero herded the cattle into his boat and led them back to the Greek Peloponnese. Geryon may have originally been associated with the constellation Orion, his two-headed dog Orthos with the adjacent canines Canis Major and Minor, and his cattle with Taurus the bull. His father's name Khrysaor ("Golden Sword") was an appellation of the constellation Orion and most of Herakles other labours are connected with star groups. The meaning of his name is unclear. It may be connected with the ancient Greek word gê (earth) or gêryô(singing). GE′RYON or GERY′ONES (Gêruonês), a son of Chrysaor and Calirrhoë, a fabulous king of Hesperia, who is described as a being with three heads, and possessing magnificent oxen in the island of Erytheia. He acts a prominent part in the stories of Heracles. (Apollod. ii. 5. § 10.) The oxen of Geryones in Erytheia. The fetching of these oxen was a subject which was capable of great poetical embellishments, owing to the distant regions into which it carried the hero. The adventure is mentioned by Hesiod, but it is further developed in the later writers, and more especially by the Roman poets, who took a more direct interest in it, as it led the hero to the western parts of the world. The story runs as follows:-- Geryones, the monster with three bodies, lived in the fabulous island of Erytheia (the reddish), so called because it lay under the rays of the setting sun in the west. It was originally conceived to be situated off the coast of Epeirus, but afterwards it was identified either with Gades or the Balearian islands, and was at all times believed to be in the distant west. Geryones kept a herd of red oxen, which fed together with those of Hades, and were guarded by the giant Eurytion and the two-headed dog Orthrus. Heracles was commanded by Eurystheus to fetch those oxen of Geryones. He traversed Europe, and, having passed through the countries of several savage nations, he at length arrived in Libya. Diodorus makes Heracles collect a large fleet in Crete, to sail against Chrysaor, the wealthy king of Iberia, and his three sons. On his way he is further said to have killed Antaeus and Busiris, and to have founded Hecatompolis. On the frontiers of Libya and Europe he erected two pillars (Calpe and Abyla) on the two sides of the straits of Gibraltar, which were hence called the pillars of Heracles. As on his journey Heracles was annoyed by the heat of the sun, he shot at Helios, who so much admired his boldness, that he presented him with a golden cup or boat, in which he sailed across the ocean to Erytheia. He there slew Eurytion, his dog, and Geryones, and sailed with his booty to Tartessus, where he returned the golden cup (boat) to Helios. Heracles and three-bodied Geryon, Athenian black-figure amphora C6th B.C. "Kallirhoe (Callirhoe), daughter of Okeanos (Oceanus) lying in the embraces of powerful-minded Khrysaor (Chrysaor) through Aphrodite the golden bore him a son, most powerful of all men mortal, Geryones, whom Herakles in his great strength killed over his dragfoot cattle in water-washed Erytheia [the Sunset Isle]." 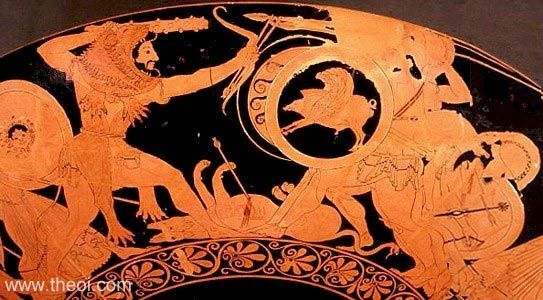 "Khrysaor (Chrysaor), married to Kallirhoe (Callirhoe), daughter of glorious Okeanos (Oceanus), was father to the triple-headed Geryon, but Geryon was killed by the great strength of Herakles at sea-circled Erytheis (Erythea) beside his own shambling cattle on that day when Herakles drove those broad-faced cattle toward holy Tiryns, when he crossed the stream of Okeanos and had killed Orthos and the oxherd Eurytion out in the gloomy meadow beyond fabulous Okeanos." "Theolytos (Theolytus) says that he [Herakles] sailed across the sea in a cauldron [i.e. across Okeanos (Oceanus) to reach Geryon in Erytheia]; but the first to give this story is the author of the Titanomakhia." "The ancient writers seem to call the Baetis [a river in southern Spain, now called Guadalquivir] Tartessos, and Gadeira [i.e. Gades, now Cadiz] and the nearby island Erytheia. This, it is supposed, is why Stesichorus sould say of Geryon's herdman [Eurytion] that he was born ‘almost opposite famous Erytheia . . by the limitless silver-rooted [i.e. because silver was mined in the region] waters of the river Tartessos in the hollow of a rock.’"
"[Menoites (Menoetes) urges Geryon to think of his parents :] ‘Your mother Kallirhoe (Callirhoe) and Khrysaor (Chrysaor), dear to Ares.’"
"And seeing him [Herakles] coming she [Kallirhoe (Callirhoe)] addressed him [her son Geryon] : ‘Strength wins victory . . ((lacuna)) hateful . . ((lacuna)) white . . ((lacuna)) Obey me, my child.’"
"[Kallirhoe (Callirhoe) addresses her son Geryon :] ‘I, unhappy woman, miserable in the child I bore, miserable in my sufferings; but I beseech you, Geryon, if ever I offered you my breast . . ((lacuna)) at your dear (mother's side,) gladdened . . ((lacuna)) by (your feasting).’ (With these words she opened) her fragrant robe." "(For no-one) remained by the side of Zeus, king of all [in the assembly of the gods]; then grey-eyed Athene spoke eloquently to her stout-hearted uncle, driver of horses [Poseidon]: ‘Come now, remember the promise you gave and (do not wish to save) Geryon from death.’"
[Herakles arrow] (Bringing) the end that is hateful (death), having (doom) on its head, befouled with blood and with . . ((lacuna)) gall, the anguish of the dapple-necked Hydra, destroyer of men [i.e. Herakles used an arrow poisoned with the Hydra's venom]; and in silence he thrust it cunningly into his brow, and it cut through the flesh and bones by divine dispensation; and the arrow held straight on the crown of his head, and it stained with gushing blood his breatplate and gory limgs; and Geryon drooped his neck to one side, like a poppy which spoiling its tender beauty suddenly sheds its petals." "Stesikhoros says that Helios (the Sun) sailed across Okeanos (Oceanus) in a cup and that Herakles also crosssed over in it when travelling to get Geryon's cattle." "Stesikhoros in his Geryoneis calls an island in the Atlantic sea Sarpedonian." "Geryon is son of Kallirrhoe (Callirhoe), daughter of Okeanos (Oceanus), and Khrysaor (Chrysaor). Stesikhoros says he has six hands and six feet and is winged." "[Herakles] killed Geryones, son of Khrysaor (Chrysaor)." "The labours of Herakles; for he drave to the Kyklopian (Cyclopian) portals of Eurystheus the kine of Geryon, which he had won neither by prayer nor by price." "Or if he had died as often as reports claimed, then truly he might have had three bodies, a second Geryon, and have boasted of having taken on him a triple cloak of earth, one death for each different shape." "Starting thence, when that he [Herakles] had crossed Okeanos (Oceanus) in a golden bowl [belonging to the sun-god Helios], he drave the straight-horned kine from the uttermost parts of the earth, slew the evil herdsmen [Eurytion] and their triple-bodied master [Geryon], who wielded three spears in his (right) hands; in his left, extending three shields, and shaking his three crests, he advanced like unto Ares in his might." "Pindar . . . in the ode says--‘Law the sovereign of all, mortals and immortals,’ which, so he continues,--‘Carries all with highest hand, justifying the utmost force: in proof I take the deeds of Herakles, for unpurchased.’ . . . It tells how he drove off the cows as neither a purchase nor a gift from Geryones; taking it as a natural right that cows ar any other possessions of the inferior and weaker should all belong to the superior and stronger." "[A metaphor employed by Plato :] If a man were gifted by nature with the frame of a Geryon or a Briareus, with his hundred hands, he ought to be able to throw a hundred darts." "The tenth labour assigned to Herakles was to fetch the cattle of Geryon from Erytheia (Erythea). Erytheia was an island, now called Gadeira [Gades], lying near Okeanos (Oceanus). On it lived Geryon, son of Khrysaor (Chrysaor) and Okeanos' daughter Kallirrhoe (Callirrhoe). He had the bodies of three men joined into one at the belly, but splitting into three again from the flanks and thighs down. He owned crimson-colored cattle, which were herded by Eurytion and protected by Orthos (Orthus), the hound with two heads born of Ekhidna (Echidna) and Typhon. As Herakles proceeded through Europe to these cattle, he killed many wild animals, paid a visit to Libya, and went on to Tartessos (Tartessus) where he set up two steles opposite each other at the borders of Europe and Libya, as commemorative markers of his trip. Then, when Helios (the Sun) made him hot as he proceeded, he aimed his bow at the god and stretched it; Helios was so surprised at his daring that he gave him a golden goblet, in which he crossed Okeanos. When he reached Erytheia he camped on Mount Atlas. The dog smelled him there and went after him, but he struck it with his club, and when the cowherd Eurytion came to help the dog, he slew him as well. Menoetes, who was there tending the cattle of Haides, reported these events to Geryon, who overtook Herakles by the Athemos (Athemus) river as he was leading away the cattle. 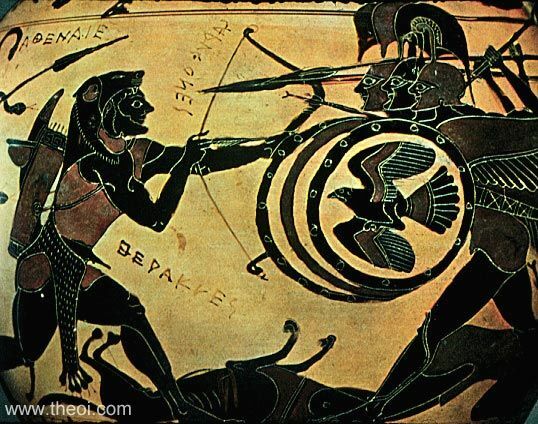 They fought, and Herakles slew Geryon with an arrow. He then loaded the cattle into the goblet, sailed back to Tartessos, and returned the goblet to Helios." "Herakles, it is told, after he had taken the kine of Geryones from Erytheia, was wandering through the country of the Keltoi (Celts)." "Herakles, driving the cattle of Geryones, came to this land [Skythia (Scythia)], which was then desolate, but is now inhabited by the Skythians. Geryones lived west of the Pontos (Pontus), settled in the island called by the Greeks Erytheia, on the shore of Okeanos (Oceanus) near Gadeira, outside the pillars of Herakles." "Eurystheus then enjoined him [Herakles] as a tenth Labour the bringing back of the cattle of Geryones, which pastured in the parts of Iberia [Spain] which slope towards the ocean. And Herakles, realizing that the task called for preparation on a large scale and involved great hardships, gathered a notable armament and a multitude of soldiers as would be adequate for this expedition. For it had been noised abroad throughout all the inhabited world that Khrysaor (Chrysaor, Golden-Sword), who received this appellation because of his wealth, was king over the whole of Iberia, and that he had three sons [i.e. the three-bodied Geryon] to fight at his side, who excelled in both strength of body and the deeds of courage which they displayed in contests of war; it was known, furthermore, that each of these sons had at his disposal great forces which were recruited from warlike tribes. It was because of these reports that Eurystheus, thinking any expedition against these men would be too difficult to succeed, had assigned the Herakles the Labour just described." "And after Herakles had visited a large part of Libya he arrived at the ocean near Gadeira, where he set up pillars on each of the two continents. His fleet accompanied him along the coast and on it he crossed over into Iberia. And finding there the sons of Khrysaor (Chrysaor) encamped at some distance from one another with three great armies, he challenged each of the leaders to single combat and slew them all, and then after subduing Iberia he drove off the celebrated herds of cattle." "Silver and gold money is not used by them [the Baliares who dwelt on islands off the coast of Iberia (Spain)] at all, and as a general practice its importation into the island is prevented, the reason they offer being that of old Herakles made an expedition against Geryones, who was the son of Khyrsaor (Chrysaor) and possessed both silver and gold in abundance. Consequently, in order that their possessions should consist in that against which no one would have designs, they have made wealth in gold and silver alien from themselves." "The mountain in which the river Baetis is said to rise [in southern Iberia (Spain)] is called ‘Silver Mountain’ on account of the silver-mines that are in it . . . The ancients seem to have called the Baetis River [of Hispania] ‘Tartessos’; and to have called Gades and the adjoining islands ‘Erytheia’; and this is supposed to be the reason why Stesikhoros spoke as he did about [Eurytion] the neat-herd of Geryon, namely, that he was born ‘about opposite famous Erytheia, beside the unlimited, silver-rooted springs of the river Tartessos (Tartessus), in a cavern of a cliff.’ Since the river had two mouths, a city was planted on the intervening territory in former times, it is said,--a city which was called ‘Tartessos,’ after the name of the river . . . Further Eratosthenes says that the country adjoining Kalpe (Calpe) is called ‘Tartessis,’ and that Erytheia is called ‘Blest Island’ (Nesos Eudaimos)." "By ‘Erytheia,’ in which the myth-writers place the adventures of Geryon, Pherekydes (Pherecydes) seems to mean Gades [a city and island off the coast of Southern Iberia (Spain)]. Others, however, think that Erytheia is the island that lies parallel to this city [Gades] and is separated from it by a strait of a stadium in width, that is, in view of the fine pasturage there, because the milk of the flocks that pasture thee yields no whey. And when they make cheese they first mix the milk with a large amount of water, on account of the fat in the milk. Further, the animals choke to death within fifty days, unless you open a vein and bleed them. The grass upon which they graze is dry, but it makes them very fat; and it is from this fact, it is inferred, that the myth about the cattle of Geryon has been fabricated." "The poets who came after Homeros (Homer) keep dinning into our ears similar stories [myths set in Iberia (Spain)]: the expedition of Herakles in quest of the kine of Geryon and likewise the expedition which he made in quest of the golden apples of the Hesperides." "But what really caused me surprise is this. There is a small city of upper Lydia called ‘The Doors of Temenos’. There a crest broke away in a storm, and there appeared bones the shape of which led one to suppose that they were human, but from their size one would never have thought it. At once the story spread among the multitude that it was the corpse of Geryon, the son of Khrysaor (Chrysaor), and that the seat also was his. For there is a man's seat carved on a rocky spur of the mountain. And a torrent they called the river Okeanos (Oceanus), and they said that men ploughing met with the horns of cattle, for the story is that Geryon reared excellent cows. And when I criticized the account and pointed out to them that Geryon is at Gadeira, where there is, not his tomb, but a tree showing different shapes, the guides of the Lydians related the true story, that the corpse is that of Hyllos (Hyllus), a son of Gaia (Gaea, Earth), from whom the river is named. They also said that Herakles from his sojourning with Omphale called his son Hyllos after the river." 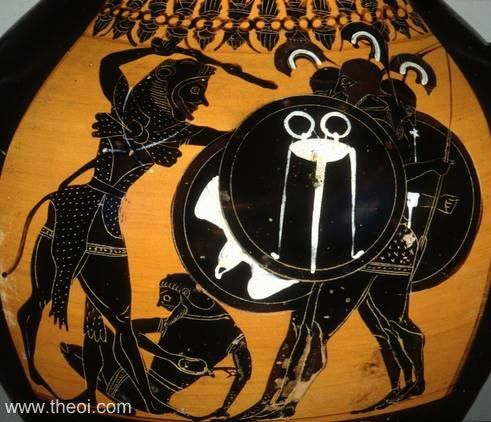 "[Amongst the scenes depicted on the throne of Apollon at Amyklai (Amyclae) :] Herakles is driving off Geryon's cows." "It seems the man of those days made it their business to amass wealth of this kind, herds of horses and cattle, if it is the case that . . . Eurystheus, in view of the reputation of the Iberian cattle, ordered Herakles to drive off the herd of Geryones. Eryx too, who was reigning in Sikelia (Sicily), plainly had so violent a desire for the cattle from Erytheia that he wrestled with Herakles, staking his kingdom on the match against these cattle." "[Amongst the images decorating the temple of Zeus at Olympia :] Above the doors of the temple is carved . . . [Herakles' exploit] against Geryones at Erytheia." "[Amongst the scenes depicted on the chest of Kypselos (Cypselus) at Olympia :] The combat between Herackles and Geryones, who is represented as three men joined to one another." "The tradition is that this [Nora] was the first city in the island [of Sardinia], and they say that Norax [who founded it] was a son of Erytheia, the daughter of Geryones, with Hermes for a father." 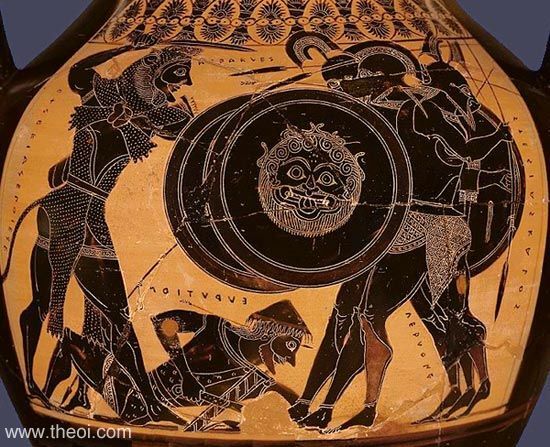 "[Depicted on the shield of Herakles' grandson Eurypylos :] There lay the bulk of giant Geryon dead mid his kine. His gory heads were cast in dust, dashed down by that resistless club. Before him slain lay that most murderous hound Orthros (Orthrus), in furious might like Kerberos (Cerberus) his brother-hound: a herdman lay thereby, Eurytion, all bedabbled with his blood." "The Bulls of Khaonia (Chaonia) which, the inhabitants of Thesprotia and Epeiros (Epirus) call ‘fatted,’ trace their descent from the oxen of Geryones." "The city of Gadeira [in Iberia] is situated at the extreme end of Europe . . . They say that the latter [Herakles of Thebes] penetrated as far as the neighbouring city of Erytheia, on which occasion he took captive Geryon and his cows; and they say that in his devotion to wisdom he traversed the whole earth to its limits . . . They say also that they saw trees here [at Gadeira] such as are not found elsewhere upon the earth; and that these were called trees of Geryon. There were two of them, and they grew upon the mound raised over Geryon: they were a cross between the pitch tree and the pine, and formed a third species; and blood dripped from their bark, just as gold does from the Heliad poplar." "He [Hephaestion] recounts that Hera who fought on the side of Geryon was wounded on her right by Herakles." "These [the breed of bulls called Syrian] are they which report said Herakles, the mighty son of Zeus, when fulfilling his labours, drove of old from Erytheia, what time he fought with Geryoneus beside Okeanos (Oceanus) and slew him amid the crags; since he was doomed to fulfil yet another labour, not for Hera nor at the behest of Eurystheus, but for his comrade Arkhippos (Archippus), lord of holy Pella." "From Chrysaor and Callirhoe [was born] : three-formed Geryon." "The triple-bodied Geryon, son of Chrysaor, he [Heracles] killed with a single weapon." "I [Heracles] faced unafraid . . . the triple heads of the herdsman of Hiberus [Geryon]." "[Heracles] told of the deeds . . . The triple prodigy, Geryones, rich in Iberian cattle, who was one in three." "Many varieties of monsters can be found stabled here at the doors [of Hades] . . . the ghost of three-bodied Geryon." "On the side facing Hispania [i.e. Spain] at a distance of about 100 yards is another island one mile long and one mile broad, on which the town of Gadis was previously situated; Ephorus and Philistus call this island Erythea . . . It was called Erythea, because the original ancestors of the Carthaginians, the Tyrians, were said to have come from the Red Sea. This island is believed by some people to have been the home of the Geryones whose cattle were carried off by Hercules; but others hold that that was another island, lying of Lusitania, and that an island there was once called by the same name." "[The labours of Heracles :] Among his herds in the distant land of Hesperia [Spain] the three-shaped shepherd [Geryon] of the Tartesian shore was killed and his cattle driven as spoil from the farthest west; Cithaeron has fed the herd once to Oceanus known." "Threefold Geryon by one hand [Heracles'] overcome." "Boulei diamachesthai Geruoni tetraptiloi--Do you want to do battle with a four-winged Geryon? : That is, with a three-headed [one]. For he had three crests on his helmet and gave Herakles a hell of a struggle." "Geryones: A proper name. Aristophanes [writes] : ‘do you want to do battle with a four-winged Geryones?’. Meaning four-headed . . . For Geryones, being three-headed, gave Herakles one hell of a struggle." "Trikephalos (three-headed) : For Geryones, being three-headed, gave Herakles a hell of a struggle."